Now we are coming to the end of this, finally. Here you can see the air from the CPU comes up. 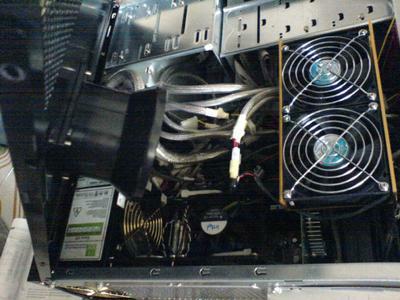 The PSU has 2 fans too. 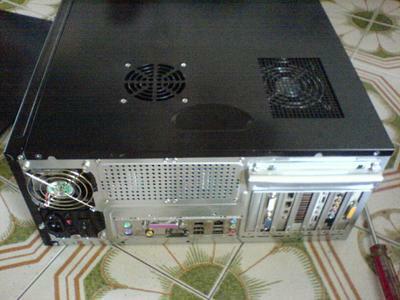 One blowing towards the optical drives and the other is shown here blowing at the CPU. 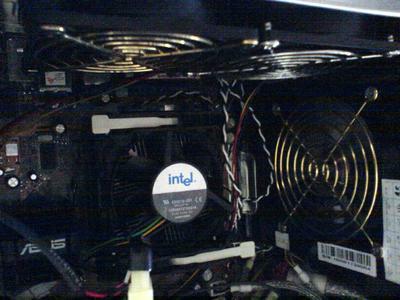 The back fans draws out the hot air and when covered, the casing actually has a funnel to channel out most of the hot air out via the side of the casing as well. See the funnel I am talking about. This is also the reason why I left space near the CPU as well. This show the back, but notice the top part. That is how the fans look like after the cover. You can see the dual fans which pull in air here and the funnel which channel out air. Just bear with me, one more last post.